When connected with Samsung SmartThings, Amazon Echo allows you to access your home lighting as well as other sensing equipments like door/window sensors, motion sensors etc. with your voice. Together, they make a sweet couple, with Alexa providing an easier and seamless way to control smart home devices, without the need for a smartphone, tablet or any smart device. This guide will help you connect Amazon Echo with Samsung SmartThings in six easy steps. We’ll further explore how you update newly added devices to Alexa, without reconfiguration. Lastly, we show you how can delete all the configuration and unlink the sweet pair, should the need be. Step 1: Download the SmartThings app of your Android, iOS and Windows Phone devices and create your accounts. Setup the Amazon Echo and down the Alexa app. Step 2: In the Alexa app go to Settings–>Connected Home. Under the Device Links, select Link with SmartThings. Enter your SmartThings account details and tap Log In. Step 3: Select the location of your SmartThings from the dropdown menu. Step 4: The SmartThings on/off switches, dimmer switches, and thermostats will appear in My Device List. Step 5: Check all the boxes which you want your Amazon Echo to access and operate and tap Authorize. 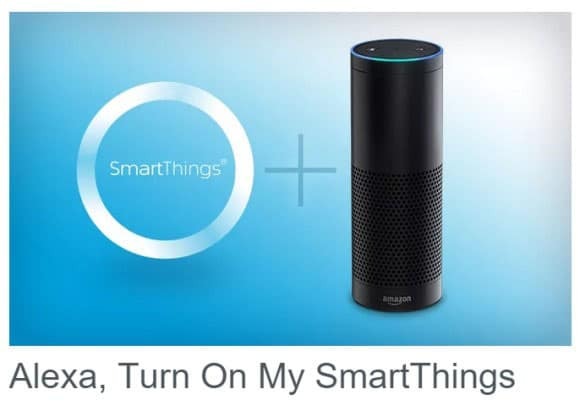 You will get the message “Alexa has been successfully linked with SmartThings.” Close the window by clicking the “x” button. Step 6: The app will automatically navigate you to the Settings page of Connected Home. Now ask your Amazon Echo to discover devices you have given access to. For this click Devices–>Discover Devices or just say “Alexa, discover new devices”. Step 7: After some time you will get the message ” Devices Discovered” and you will see the discovered devices under the Devices section. Other devices will be greyed out. After this you can try out several commands with Alexa. Step 1: In the SmartThings app, go to Menu–>SmartApps–>Amazon Echo. In MyDeviceList you will see the devices to which Echo has access to. Step 2: Click on Done–>Next and just follow the in-app device instructions. Tap Done. Just go to SmartThings app and tap Menu–>SmartApps–>Amazon Echo–>Remove. Also in the Amazon Echo App go to Settings–>Connected Home–>Device Links–>Unlink from SmartThings.